news Problems with the storage area network serving Microsoft’s Tech.Ed conference on the Gold Coast this week have resulted in some attendees not being able to complete the Microsoft-focused training they had booked in for. In the several days before the Tech.Ed conference kicks off formally, Microsoft hosts training sessions for conference attendees using giant banks of PCs and extensive backing infrastructure. The sessions are a major drawcard for conference attendees, as they aid organisations in justifying the cost of attending Tech.Ed — Microsoft’s largest annual conference in Australia. However, this year, not all has gone according to plan. According to McManus, the problems continued as the Tech.Ed training sessions wore on — with “endless loading/progress bars, VMs that wouldn’t start and generally very slow or poor performance” plaguing users’ machines. The Tech.Ed infrastructure this year appears to have been constructed with the aid of Microsoft partner HP. These kind of system failures at conferences are fairly common — ever tried to connect to a conference centre’s wireless connection? — but we’re a bit surprised to see them taking place at Tech.Ed. Normally Microsoft exhaustively tests the infrastructure at its flagship conferences, and we’re sure there are some engineers within the Microsoft camp this week kicking themselves up and down the block for the issues. Hyper-v fail….. HP san failure…. Love it! Hyper-V did not Fail. The SAN was just inadequate to deal will 200 people simultaneously copying over 5 GB in unicast. Try no to love a lie. It does say “crashing VMs”, and while true Hyper-V might not have failed here as the SAN failed first, but rest assured hyper-v is a failure of a product and would have failed! This morning, things were markedly different. On arrival in my lab, I noted that the workstations we were using had been re imaged overnight to include all labs on the local machine. Bleary-eyed techs were seen still working on this early in the day, and it would appear an epic all nighter had been pulled to turn the train wreck of the day before around. My labs today ran smoothly, my fellow attendees and I were happy and learning great stuff, and the outcome has been fantastic. I agree, It is not the initial problem that defines an organization, it is the response, and Microsoft Responded extremely well. 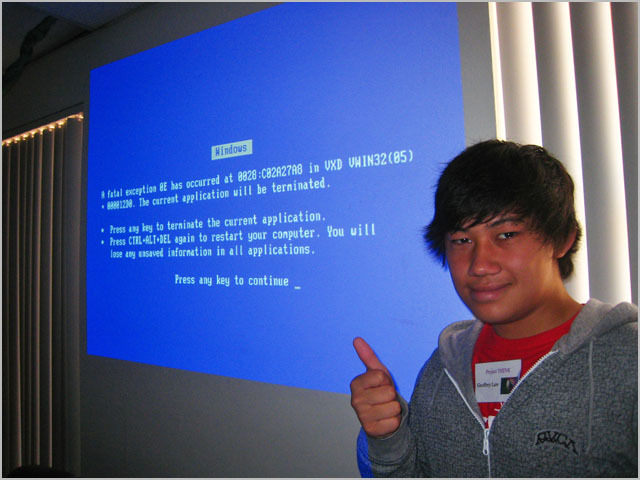 PS where did this bluescreen picture come from..there were no BlueScreens from my knowledge. and this room in the picture doesn’t even look like a room at the Gold Coast Exhibition Center!!! is this just a propaganda pic?? It is definately not the Training rooms in question. Maybe Microsoft could lease some capacity from the VMworld labs that are running in Las Vegas at the moment……..